Supervisor Jane Kim represents San Francisco’s District 6, which includes the Civic Center area, Mission Bay, South of Market, and the Tenderloin. Kim also sits on the SF County Transportation Authority’s Vision Zero Sub-Committee, where last week she took SFMTA to task for not moving fast enough to install safety measures that might have saved the lives of Kate Slattery and Amelie Le Moullac, two cyclists killed in her district on a route she cycles herself. 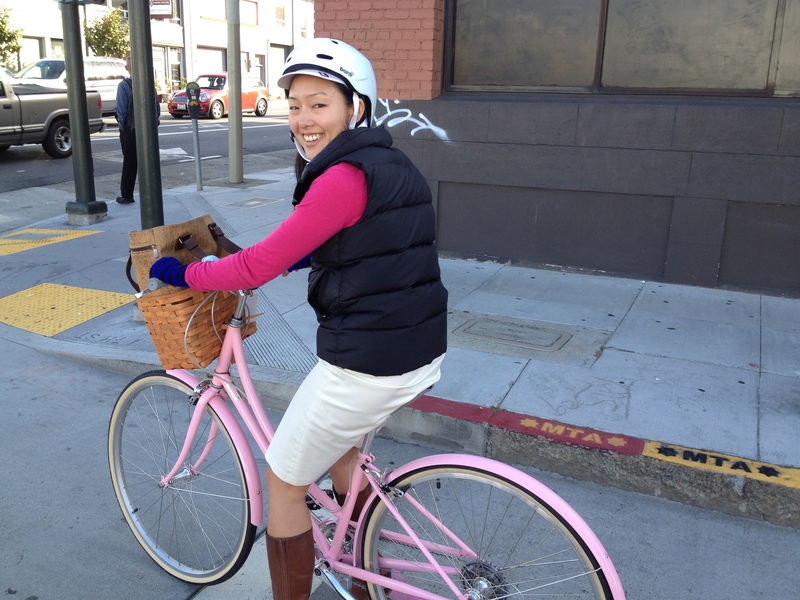 Streetsblog did a phone interview with Kim, who is currently traveling on the East Coast, to find out her hopes and vision for how San Francisco can make its streets safer and less dominated by automobiles. Streetsblog: You may have seen a photo circulating around—I saw it on the SF Bike Ride Crew’s Facebook page—of SFPD cracking down on cyclists on the Third Street bridge for riding on the sidewalk. Meanwhile, during the vigil for Kate Slattery, safe-streets advocate Randall Dietel tracked a car with a radar gun blowing through a red light at 65. How do we get SFPD to focus precious resources on stopping deadly activities? Jane Kim: We have been asking for more enforcement from SFPD and SFMTA but that’s just one way of changing behaviors. Speed was a factor in the case of the two recent fatalities. This is something the board has been asking for since 2014. I do see southern station [officers] a lot on Folsom, between Sixth and Seventh. I see them ticket cars in the mornings, but it’s not consistent throughout the day, and these [the speeders that killed Slattery and the one that sped past her vigil] occurred late at night. And that’s probably when the speeding is really occurring; we need to see this enforcement at night. SB: During the Vision Zero meeting, you complained that cities such as New York and Chicago seem to get street improvements in more quickly than San Francisco. That’s probably true, but I think just as importantly, when other cities put in temporary infrastructure, it’s a planter, or some kind of heavy object that can actually stop a car–it’s not just paint and maybe plastic bollards, if we’re lucky. JK: I agree with you, that seems like something we should be able to do. Regardless, two years after we called for Vision Zero we should have some protected bike lanes. I can’t tell you how frustrating it is to fight for these bike lanes and see cars driving on them. I was so excited to get the Golden Gate bike lane, but it’s just not designed in a way to prevent conflicts. I’m frustrated now that we’re a little too dependent on these temporary pilots that are meant to be a band-aid, and we’re not building protected bike lanes. We have to put in better infrastructure. SB: What about parking-protected bike lanes? That can be done quickly too. JK: I really don’t understand the challenge to putting in parking-protected bike lanes, because it seems like it would require far less material and time because you’re simply moving the parked cars over and you move the bike lane over to the sidewalk. I would like to see more of that on Folsom and Howard. SB: Speaking of protected bike lanes, last year you and a delegation went to Copenhagen. What lessons did you learn from that trip? JK: Everyone goes slower in Copenhagen, the drivers and the cyclists. Seniors and children bike–I was struck by the diversity of the bikers, their genders and their ages. Also, I learned there isn’t something magic in the water in Copenhagen that makes people ride bikes. It’s not that Copenhagen is European or more liberal. In the 1980s, their cities were also dominated by cars. Copenhagen was clogged with cars and people were angry about it. But they made the shift. SB: So how do we make that shift in San Francisco? JK: They reached a tipping point. I’m in New York right now. Every time I visit it’s amazing to see the transition. When I was growing up here, people hated bikers; most New Yorkers did not bike. And now you see it everywhere and it’s great. SB: So you see great value in researching other cities and copying what they’ve done? JK: Information sharing is great. When I visited Seoul, Korea I was really struck by how they’ve built public transit. But also by how they manage traffic. JK: They have pedestrian safety teams. Whenever anyone gets hit, they take it seriously and look at the intersection. It shows you what’s possible when you’re willing to put the resources in. And their enforcement is amazing. They have cameras all over the city. There’s a control center and you go in and it’s a huge room that screens all major streets to direct parking enforcement. SB: So we can do that too. Speaking of cameras, during the Vision Zero meeting you talked about Automatic Speed Enforcement. JK: I think it’s the key way to make SF a safer city and it’s frustrating that our state legislators aren’t willing to move forward on a concept that we know has saved lives. With Vision Zero, Sweden has showed us controlling speed is key to saving lives. SB: At the committee meeting, you said something about SF going it alone–maybe even encouraging a showdown on the issue with Sacramento? JK: We’re exploring that right now, my staff and my team, with the MTA looking to see what would happen if we bought our own cameras. Maybe we start by issuing warnings if we can’t issue citations. SB: So even if Sacramento doesn’t clear Automatic Enforcement, perhaps SF can adapt that approach from Seoul and maybe direct SFPD to intercept any speeding cars spotted on camera? JK: Right, right, right. I’m afraid I’ve got to run. SB: One last question if I may. You started as a civil rights attorney. Do you see a connection between civil rights and protecting the most vulnerable road users? JK: I think it comes more from my principles as an urbanist. One of the reasons I love my job is I get to shape the future of our city. My district is in downtown and we’re absorbing 80 percent of all of SF residential and commercial growth. We have an opportunity to build the right infrastructure for our new neighborhoods. A key piece of that is building a neighborhood that is not as car-oriented. Neighborhoods that are bike and pedestrian-oriented means building healthier neighborhoods. And that’s good for all of us.